Our Powerful Mass Notification System Is Now Right In Your Pocket! With the DialMyCalls mass notification app you can easily notify entire groups of people in seconds via phone call or text message. Our system can send over 3,000 phone calls or text messages per minute, making sure your message gets sent immediately. It’s also ideal for emergency notifications where you might be away from your office or home and need to reach people quickly. Get detailed reports after your message broadcast has been sent right from within the DialMyCalls App. You’ll be able to easily see who recieved your notification and who didn’t. 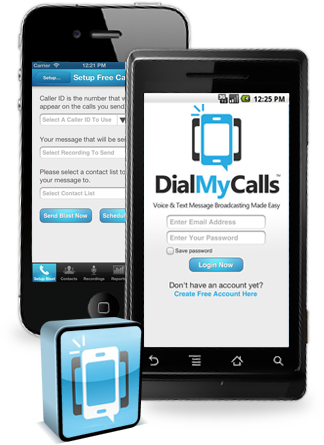 Works with all DialMyCalls accounts; free, credit based and monthly service users. All accounts are able to record messages, send blasts and view your reports through the app. You now have the ability to purchase credits directly within the app. As always you can use it completely free to try send out some notifications to see how it works. Call us right now if you have any questions at (800) 928-2086!